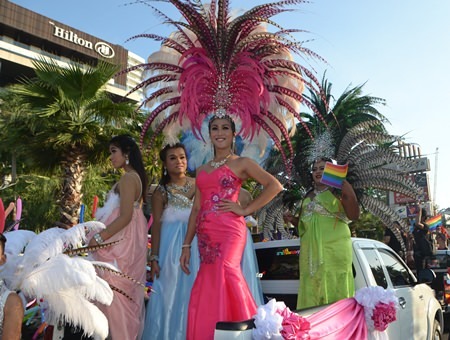 About 200 members of Pattaya’s gay community paraded down Beach Road for the start of the city’s Gay Pride Festival. 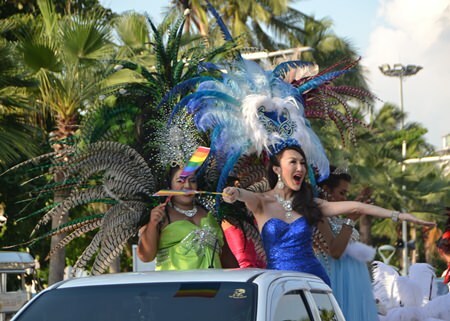 Organized by operators of 10 gay bars, the Oct. 14 procession was led by Pichaya Areerob, an executive with the Pattaya Dragon Project. The parade featured many shows and conveyed a festive atmosphere along the procession’s route. 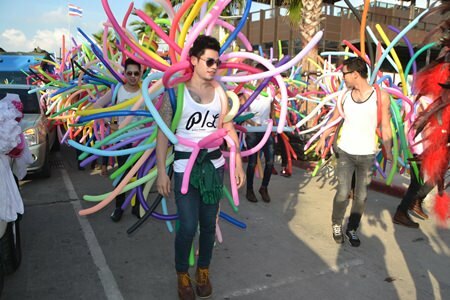 Pichaya said the festival has been organized due to the increase in gay tourists to Pattaya, a rise obvious in the attendance at the city’s many gay bars. However, she said, August’s Bangkok bombings have put a dent in visits this fall, so the parade was organized to gain publicity and draw LGBT tourists to return. The festival also aimed to promote the upcoming World AIDS Day and generate interest in Pattaya’s Dec. 1 commemoration, she said. Colorful dancers and performers from venues around town participate in the Gay Pride Parade.